I have discovered that the best way to encourage my children to exercise and let loose with their extra energy is to have a musical “dance hour.” My children love to sing and dance and I am always searching for age appropriate and fun ways for them to express themselves. Music For Creative Kids “Around the House”-Volume 1 is a new musical CD with 18 original songs and 5 karaoke bonus instrumental songs that fits all of those criteria as it encourages teamwork, helping around the house and fun at home. My kids (and I confess even myself) bopped around our living room to “The Hoover Manoeuver” and the upbeat “The Banana Banana Song”. Performed by Maggie G. (Margot Glatt) the songs are original and smart, a refreshing change from the same old preschool songs. By the third time around, my kids were able to sing along with some of the lyrics. The kids were delighted to find a “concert” themed Poster to personalize included with the CD for the kids to color during craft time. 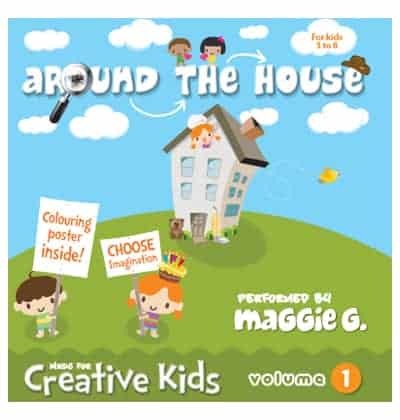 If you are looking for children’s music that will appeal to children and adults alike then I highly recommend Music for Creative Kids-“Around the House” Volume 1. This is one CD that will continue to be played frequently in our home. Retails for $15.98 (recommended for ages 3-8 but my two year old was dancing along too). 7. The Banana Banana Song! Thanks for the chance to win! My favorite is The Nap Song. I like the Pizza Party song!